"Large randomized trials have provided inconsistent evidence regarding the benefit of intensive blood pressure lowering in hypertensive patients," said corresponding author Dr. Yang Xie, Director of the Quantitative Biomedical Research Center at UT Southwestern and of the University's Bioinformatics Core Facility. "To the best of our knowledge, this is the first study to identify a subgroup of patients who derive a higher net benefit from intensive blood pressure treatment." "I think our algorithm can help us identify high-risk patients who will most likely benefit from intensive blood pressure reduction. Long-term intensive HBP drug therapy can reduce risk of heart failure and death, but it carries an increased risk of side effects," said co-author Dr. Wanpen Vongpatanasin, Professor of Internal Medicine and holder of the Norman and Audrey Kaplan Chair in Hypertension and the Fredric L. Coe Professorship in Nephrolithiasis Research in Mineral Metabolism. 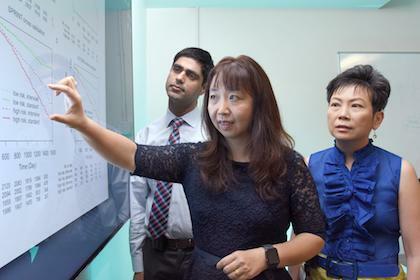 The researchers' machine learning method determined three simple criteria to identify adults with high blood pressure who are at the highest risk for early major adverse cardiovascular events – such as cardiovascular death, heart attack, or stroke. Those criteria are: an age of 74 or older, a UACR of 34 or higher, and a history of clinical cardiovascular disease, such as heart disease, stroke, or heart failure. Patients who met one or more of the three criteria were predicted to be among a high-risk group who had a greater benefit from intensive blood pressure-lowering treatment. In contrast, the team found that patients younger than age 74 who had a UACR less than 34 and no history of cardiovascular disease may do equally as well with less intensive treatment. "We feel that our findings have major clinical implications, since in addition to its predictive effects, the model generated here is simple and easy to implement in clinical practice without additional lab tests or computational tools," said Dr. Xie, who is also an Associate Professor of Clinical Sciences and Bioinformatics. "We hope that clinicians can someday use this algorithm to identify which patients should receive standard versus intensive treatment, and we hope to design a prospective clinical trial to further validate this algorithm."